Creating the digital home of a non-profit, community-facing makerspace dedicated to making tools, technology, and knowledge accessible to all. Prior to opening its doors to the community in September 2016, Open Works needed a digital presence to tell their story, attract talented staff, and begin to fill classes. They needed a bright, dynamic, inviting, mobile-responsive, and engaging site—in other words, a “virtual front door” to the facility, as well as a door welcoming community engagement, fundraising and membership signups. Through our discovery process, it became very clear that user experience, clarity, and simplicity would be crucial to this build. With the need to present everything from class descriptions and signup forms, to user accounts, store functionality and an events calendar, wireframing and collaboration with the client was just the first step. Our process is built to support a series of approvals in the process to ensure all goals are met. A simple website structure ultimately provided all-important clarity to a deep, information-rich experience. Users can easily navigate based on their interaction with the space, and what they are hoping to learn. These updates are approachable for community members of all generations, making Open Works a place for Baby Boomers to easily sign-up to kick start a new hobby or parents to schedule an outing with their kids. The new website is home to calendar of events, class descriptions, and easy-to-use class registration forms. 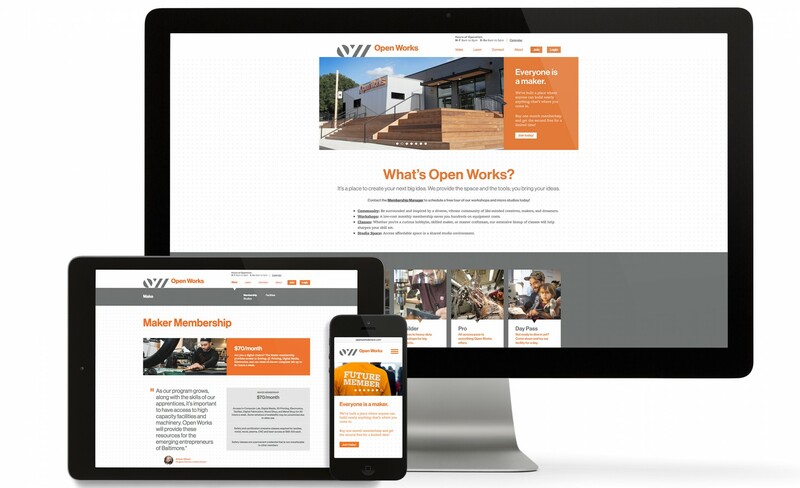 Open Works now has a user-friendly online presence to match their accessible community space. Every new class they provide can be accessed on this website for visitors to explore and sign-up.